We are delighted that talented Languedoc producer, Philippe Formentin has agreed to supply us with his exceptional wines, including a ravishing Picpoul and some wonderful lightly textured red wines.His vines are all tended using organic and biodynamic principles. The Picpoul is grown on a plot just near the village of Pinet which lies directly inland from the coastal village of Sète on the other side of the Etang du Thau.Philippe Formentin lives in the wine-obsessed town of Clermont l’Hérault. 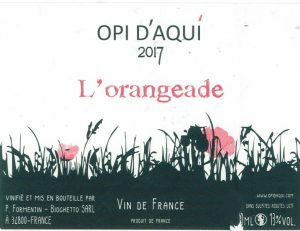 The name “Orangeade” is a light-hearted attempt to explain this wine. 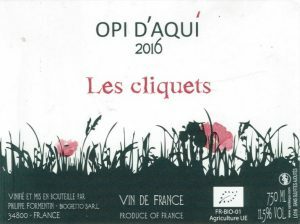 It is made by macerating the Clairette grape variety (a variety that we particularly like when in the hands of a skilled winemaker) which was destemmed and macerated for 3 weeks. He then added some Picpoul to the macerated juice to provide freshness and acidity. The proportions are 60% Clairette and 40% Picpoul. It is a lightly orange wine which we have found stands up quite well over a couple of days of being opened. It is not aggressively tannic like some macerated wines. It will go with a wide variety of foods. 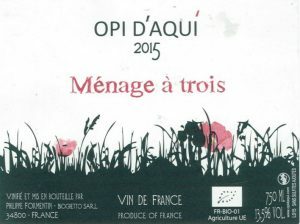 The name “Ménage à Trois” arises because the wine has been made from grapes picked from three different plots of Grenache Noir, the grape variety so beloved of the Languedoc and the Clermont l’Hérault area in particular. The grapes were destemmed and then left to macerate for 3 weeks. The juice was then transferred to old barrels for 6 months and then to stainless steel tanks for another six months. It is elegant, it is light (though not as light as last year) and it has been made with skill and care. This is a great wine for year-round drinking. Picpoul is a legendary grape variety of the area around the coastal town of Sète in the Languedoc. Here it is often teamed with oysters and other seafood dishes such as the amazing local version of the pie called Tielle de Poulpe Sètoise which is braised octopus served in a bread-dough pastry shaped almost like an Australian pie. The Picpoul grapes were picked by hand from a 1 hectare plot near Pinet (limestone and clay terroir) and placed in small 10 kg baskets. The grapes were then pressed and 50% of the juice transferred to tanks and 50% to old oak barrels for a period of 6 months. The wine was then bottled without filtration and without the addition of sulphites to ensure freshness. This Picpoul is a lively, fresh and slightly acidic (in a good way) white wine that can be enjoyed year round. 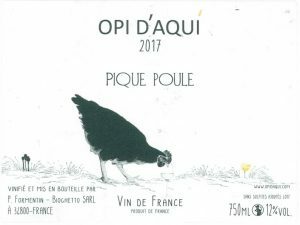 Philippe, like many of his colleagues in the natural wine movement, cannot resist playing around with the names of his wines. This one is made using the Marsanne grape variety which he sources from a friend who grows grapes organically. 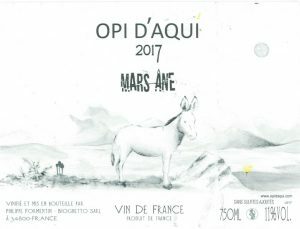 Obviously what he has done is a play on the name of the grape – the donkey (Âne) on Mars. This is a fresh, lively wine with restrained acidity, excellent minerality and a great finish making it ideal for pairing with seafood, chicken, terrines and other foods. The wine was fermented in a stainless steel tank and then was transferred to old wooden barrels for the malolactic fermentation. 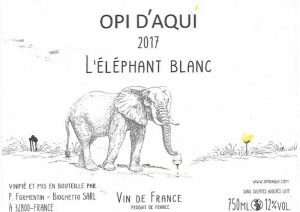 L’Éléphant Blanc is 100% Vermentino. The vines are young, only 5 years old, and the wine was briefly aged in old wood barrels. If you can lust after vines then Philippe has lusted after these ever since they were planted, partly because he spent quite a lot of time making wine in Corsica and loves this grape. The vines are actually owned by the same person who grows exclusively for him the Grenache used to make Massale and les Cliquets. This light-red, smashable wine is made from a single plot of grapes where the three Grenache varieties (Grenache Noir, Grenache Gris and Grenache Blanc) all grow. Hence this wine is a “mix” of 40% red, 30% grey and 30% white grapes that have undergone cold carbonic maceration for 3 to 4 weeks before being transferred to stainless steel tanks for 6 months to produce a wine that will match with a wide range of foods or which can simply be sipped while sitting outside in the summer sun. 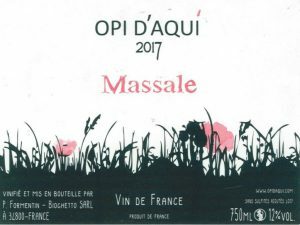 This wine has been made from 100% Grenache Noir which came from a small plot (0.8 hectares) near the town of Vendémian which lies approximately 16 kilometres south-east of Clermont-l’Hérault. The soils here are clay over limestone. The process was started using whole bunch, cold carbonic maceration for 3 weeks. It was then aged in stainless steel tanks for 6 months. It was bottled without fining or the addition of sulphites to preserve its freshness. It is a red wine, but very light in colour. It almost looks like a rosé in the glass, but it has more weight in the mouth. We love this wine! This wine is a wonderful example of the Mourvèdre grape variety. Often, when it is grown in hot climates it produces big, jammy red wines which is a style we tend to shy away from these days. However this is a supple, lively, fresh and very approachable wines where the fruit qualities shine through. Great for just sipping or teaming with food. This wine was made with the addition of 10% Grenache and underwent 3 weeks of maceration after being totally destemmed. The wine was aged for 9 months in old barrels before being transferred to stainless steel tanks for 3 months.